Joan Trumpauer Mulholland was a Freedom Rider from Arlington, VA. After the rides she stayed in Jackson, attending Tougaloo College and continuing to work in the movement. She participated in the famous May 1963 sit-in at the Woolworths lunch counter in downtown Jackson, which yielded a well-known photograph by Fred Blackwell. Today she’s being honored in a performance by the band of Jackson Academy, a private school. Below is the story from Clarion-Ledger reporter Billy Watkins. Jackson Academy’s three-song performance today at the Mississippi Private School Association’s state band competition will pump up the volume of history. The music, arranged by band director Bruce Carter and his 19-year-old son, Corey, is dedicated to Joan Trumpauer Mulholland, a white civil rights activist who is the focal point of an iconic 1963 photograph taken by Fred Blackwell of the old Jackson Daily News. Mulholland, 19 at the time of the photo, is shown being surrounded by an angry mob of young white people during a sit-in at Woolworth’s soda fountain counter in downtown Jackson. She had been doused with mustard, ketchup, water, Coca-Cola, spray paint and a bounty of insults. Pictured at the right is Annie Moody, an African-American student at Tougaloo College in Jackson. A streak of mustard and ketchup drips onto her forehead. Pictured at the left is John Salter, then a Tougaloo professor. He is covered in condiments and blood. He had been hit with brass knuckles. Mulholland, a Virginia native, was part of the Freedom Riders, who traveled South in 1961 to test the laws of desegregation on interstate buses. She was charged with breach of peace and jailed for more than two months. A portion of her imprisonment was spent in a death row cell at the State Penitentiary in Parchman. After being released, she enrolled at Tougaloo, where she was one of about five white students. She graduated in 1964. Corey Carter named his original arrangement Power of Conviction, in honor of Mulholland, to be sandwiched in the performance between Sevens by Samuel Hazo and Sinfonietta No. 3. “To have this tribute played in Jackson by a private school … I think it means even more,” Corey says. Most private schools in Mississippi were formed to fight integration in the late 1960s and early ’70s. Many MPSA member schools are integrated to some extent now. Bruce Carter’s concert band consists of all white students, but three African Americans are in the sixth-grade program. How Mulholland became the inspiration for JA’s concert presentation is a story within itself. 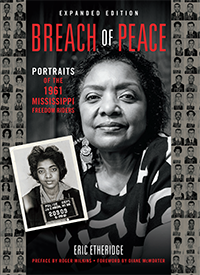 A few weeks ago, Corey Carter was standing in line at Walgreens in Jackson when he picked up the book, Breach of Peace by Mississippi native Eric Etheridge, and began to flip through it. He saw a photograph of Mulholland, who had long dark hair, a face of innocence, and a Jackson Police Department sign draped around her neck with her booking number on the front – 20975. It was from June 8, 1961, when Mulholland was arrested for breach of peace during a Freedom Rider nonviolent demonstration. Corey Carter combed the Internet, researching stories about Mulholland. He came away in awe of her. “I remember he called me and said, ‘Dad, I think we’ve found our hero’ and began to tell me about this amazing woman,” says Bruce Carter, 55, who came to JA in 1989 from New Jersey, where he taught until 2005. He returned in 2007. Bruce Carter waited until this week to share Mulholland’s story with his students. “I wanted them to focus on the notes, on timing,” he says. “Because I knew when I told them, it would give the song more meaning to them and probably raise their level of playing. After Mulholland was informed by a Clarion-Ledger reporter of the scheduled tribute, she requested a telephone visit with Bruce Carter to thank him. They talked for more than an hour Tuesday afternoon. “It was quite a moving experience for me,” Bruce Carter says. Mulholland is retired after teaching for 30 years in Virginia and raising five sons. She often comes back to Mississippi for various activities at Tougaloo. When asked about the photograph of the sit-in and what she remembers, Mulholland pauses for a moment, then chuckles. “Everything,” she says. “I’ve heard of people during war time say their souls leave their body and serve as guardian angels. That’s what happened with me. I was sitting there, knew what was happening. But the ‘real’ me was like a guardian angel above me, protecting me. Thanks to those people who fought for peace for us in 1960s. Joan has the most beautiful face I have ever seen. Joan Trumpauer is an Hero! What a courage to do the right thing! I am impressed!